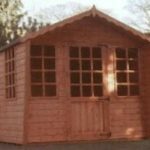 All our summerhouses are delivered flat packed with ready built side walls, floor panels and roof panels. The floor and roof sections are constructed from timber not sheet material. The felt for the roof comes ready cut to size and our sheds are supplied with glass for the windows. All fixings and instructions are supplied on delivery. 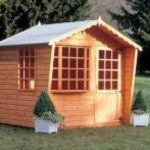 An economy styled summerhouse comes as standard with door centrally situated in the gable front end with a window either side. This building comes with generous roof overhang. The side panel with windows is standard and may be positioned either side. Sizes: 6’x6′ to 10’x8′ models available. This model offers the same roof overhang, decorative wings, mortice and tenon door and olde worlde hinges, as the alpine. Bay is configured with the door to the right of our unique non-opening bay window which adds distinction to a classic design. Sizes: 6’x8′ to 10’x10′ models available. With a substantial roof overhang and decorative stlye wings. It comes complete with a central moritce and tenoned georgian stlye door decorative olde worlde hinges and 2 matching fixed windows on the front as standard. The model is shown with shaped bargeboards. 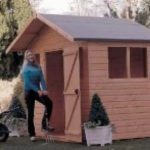 This attractive, 5-sided building will suit any corner of the garden. It comes complete with mortice and tenoned georgian stlye double doors, decorative olde worlde hinges and 2 matching fixed side windows as standard.